The NFL has a new passing king — New Orleans quarterback Drew Brees is now number-one all-time. Monday night the New Orleans Saints dominated Washington 43-19. 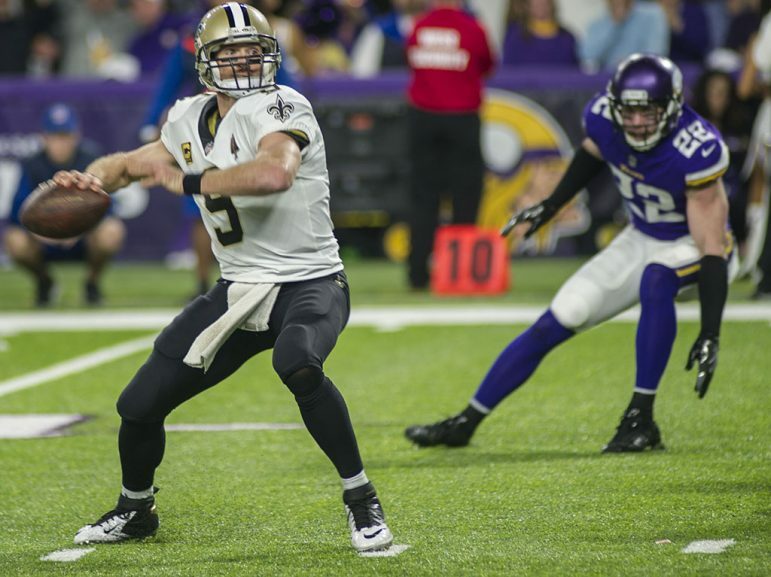 It was a record-setting 363-yard three-touchdown performance by Brees. He passed Brett Favre (71,838) and Peyton Manning (71,940). The Saints, 4-1, have won four in a row and lead the NFC South. The new mark for King Brees is 72,079 for now. Brees has thrown 499 career touchdown passes and with his next TD pass can join Manning, Favre and Tom Brady in the exclusive 500 touchdown passing club. Unlike a Major League Baseball’s season, which is called a marathon, an NFL season is like a 400-meter relay race. As we enter the second quarter of the NFL season, records continue to fall. The NFL ratings are up, and scoring is up by 80 yards per game. The Vikings upset the Super Bowl Champion Philadelphia Eagles 23-21 in the city of brotherly love Sunday, fueled by the memory of the humiliating 38-7 NFC title loss. Defensively, the Vikings forced two critical turnovers. Steven Weatherly, replacing defensive star Everson Griffen out with mental illness issues, forced a fumble. That was returned 64 yards for a touchdown by Linval Joseph. Head Coach Mike Zimmers’ reputation as a fixer was restored after allowing 38 points and 564 yards to Los Angeles. The 2018 2-2-1 Vikings may be back on target to being a playoff-caliber contender. Pro Bowl receiver Adam Thielen is doing his part. He’s on fire as the first receiver in the NFL Super Bowl era to have five straight 100-yard receiving games to start the season. Quarterback Kirk Cousins, the $84 million guaranteed man, has been a passing marvel. Cousins is the first NFL player to have four straight games of 30 completions or more. Graham Gano of Carolina kicked a 63-yard game-winning field goal to help Carolina beat New York and tie an NFL record. For the first time in NFL history, four rookie quarterbacks, all drafted in the first round of the 2018 Draft, all won on the same weekend: Cleveland’s Baker Mayfield, New York’s Sam Darnold, Buffalo’s Josh Allen, and Arizona’s Josh Rosen. The 5-0 Los Angeles Rams and Kansas City Chiefs are the only unbeaten teams. If they stay on course, they meet in Mexico City on Monday Night Football November 19. Six NFL teams are 1-4. Which one surprises you? New York, San Francisco, Arizona, Indianapolis, Atlanta or Oakland? The Cardinals are here Sunday at U.S. Bank Stadium.